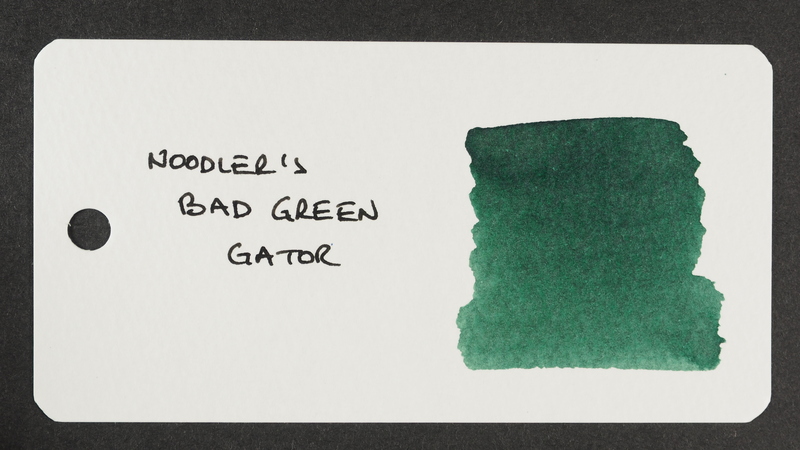 For the second in this batch of ink reviews, I have selected Noodler’s Bad Green Gator, which is one of the “Warden” series, resistant to the dark arts of the forger. 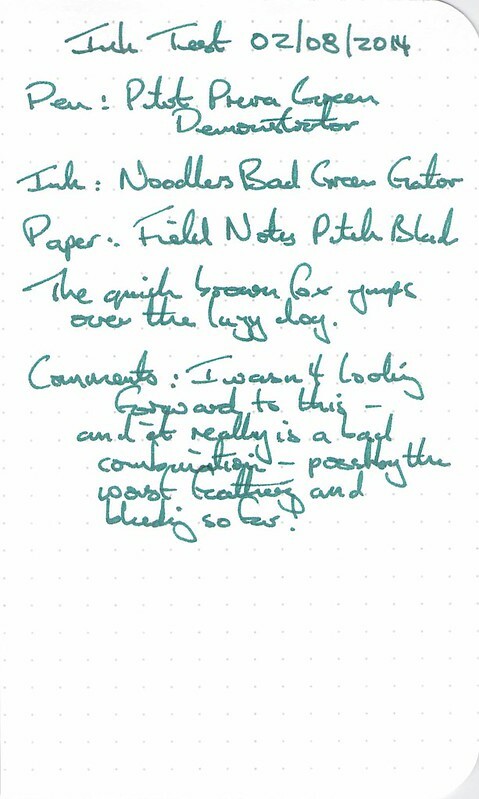 Why I would even be signing an important letter, or a cheque, with green ink I’m not really sure, but let’s park that thought. 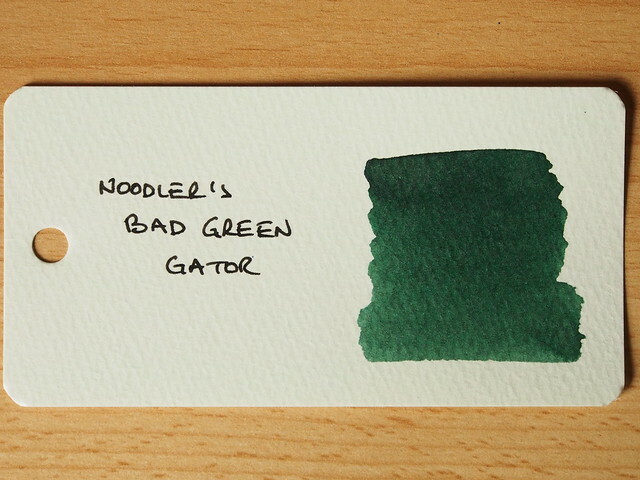 The gator from which this ink derives its name is bad because it eats catfish (the Noodler’s mascot). 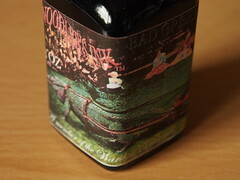 The gator pictured on the label is however being used like a pony to pull a happy child along on a cart. The label appears to be derived from postcard depicting the “Joy Ride” at the California Alligator Farm in Los Angeles. It’s difficult to read the emotion of the alligator, but I don’t detect joy, perhaps rather homicidal intent. Judge for yourself here. 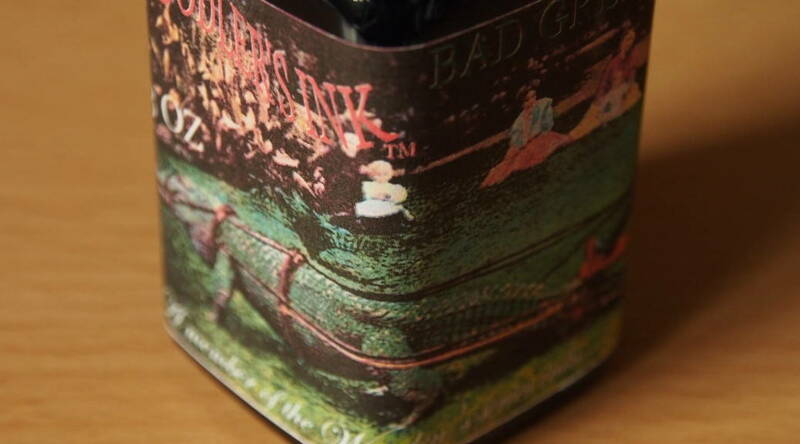 This bottle came from a UK supplier, so I would again class it as modestly priced. Standard text about bottle and box goes here. The test pen was a Pilot Prera Green Demonstrator. 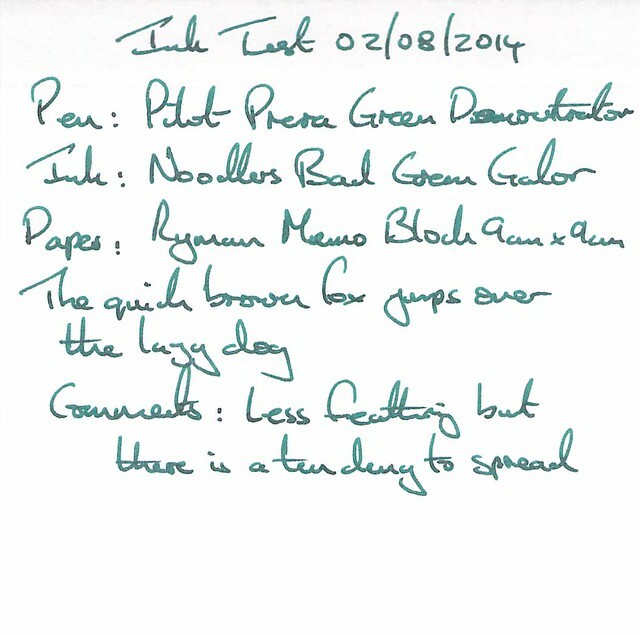 The ink was strongly water resistant (no surprise there). Drying time was quick (less than 10 seconds). Cleaning was surprisingly easy. The colour of the ink when I opened the bottle encouraged me to think I would really like this ink. However, on Rhodia paper it was a letdown. The colour leans slightly too far towards blue – and the feathering was a surprise. The other surprise was the strong methylated spirit smell – maybe that explains the quick dry time and the ease of cleaning. 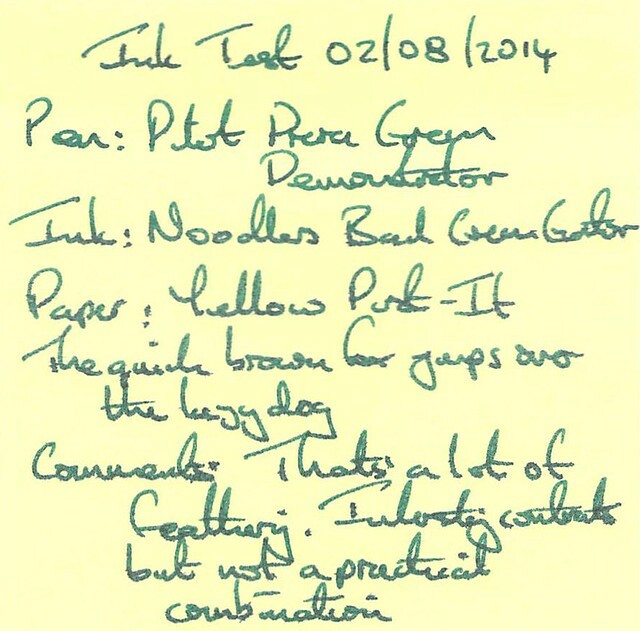 Regardless, once dry, a cotton bud dipped in meths only slightly shift the ink. 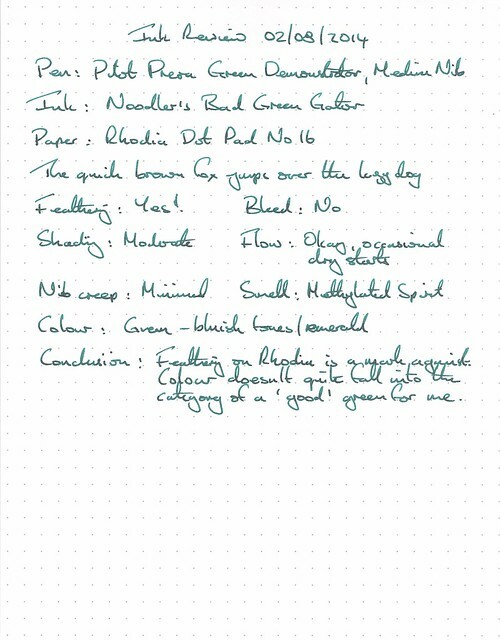 No feathering on this paper, but the ink spreads giving a broader line. This actually gives an interesting colour combination, but the feathering is a minus. After the other papers I expected severe feathering – and I got it. 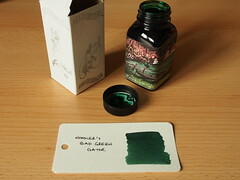 The ink probably looks at its best on the Word Card. If it looked like this on other papers I think I could tolerate the feathering. 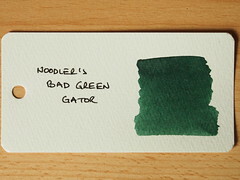 Sorry Bad Green Gator, but your quick dry time, ease of cleaning and water resistance don’t outweigh the feathering and so-so colour, meaning you are not the green ink for me.